Halloween films don’t come around nearly as often as they should. I’m talking about the holiday, not the franchise that covers the butcher knife-wielding brother of Laurie Strode; those are always hanging around. 2014 saw the release of The Houses October Built, and while that certainly seemed like a promising concept, it ultimately fell flat for most viewers. But the idea of a mysterious haunt, that was pretty interesting, and that’s exactly what Hell House LLC seems to be focusing on. In October 2009, Hell House LLC, a haunted house company based in New York, opened its annual Halloween haunted tour. Previously the tour was held every October in Manhattan, but in 2009 they left the city for unknown reasons and held the haunt in the small town of Abaddon, about forty-five minutes outside the city. The building they chose was the abandoned Abaddon Hotel. They arrived in late August to create the haunted tour in the old hotel and opened it to customers on October 8th, 2009. 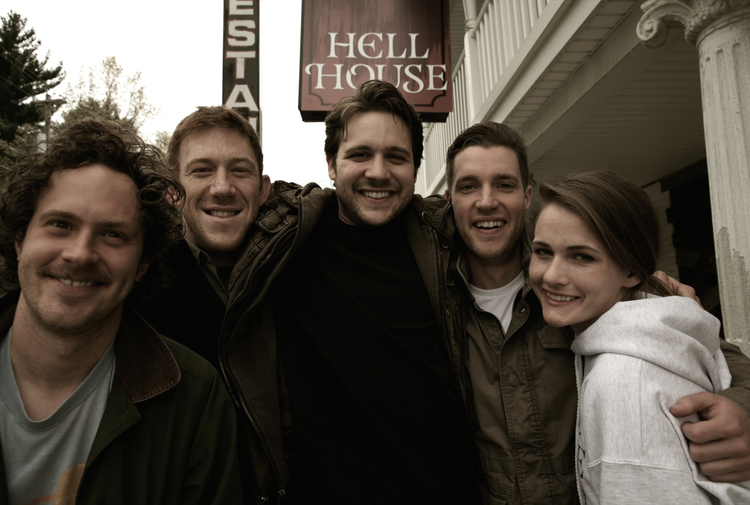 Hell House LLC from left to right: Paul O’Keefe, Andrew McNamara, Alex Taylor, Tony Prescott, Sara Havel. Picture taken sometime in late September 2009. Approximately an hour into opening night, chaos erupted amongst the tour-goers. As they decended the stairs to the basement, witnesses reported hearing screams from below but thought it was part of the show. They soon realized that the screams were in fact real and something was going very wrong in the basement. What resulted was a bottleneck traffic-jam of tour-goers coming down the stairs and others trying to flee, trapping many people in the basement as something unexplained took place. 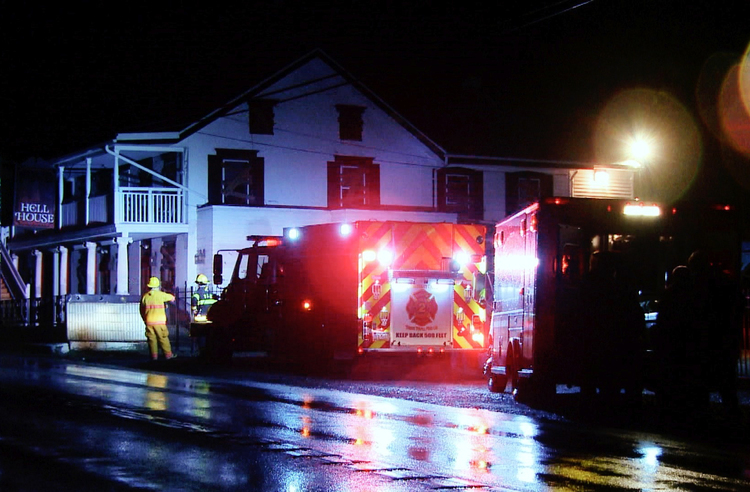 EMTs and Fire Crews at Hell House October 8th, 2009. It was thought to have been a fire that broke out opening night. A few years after the tragedy, a photographer managed to sneak inside the hotel and captured images that only deepened the mystery further. These are the only pictures the public has seen of the interior of Hell House since the opening night tragedy. To this day nobody knows what happened inside the haunted tour or how fifteen people died. This documentary answers those questions. Photo of the basement stairs in 2013. Photo of a wall somewhere along the tour route. Photo of the top of the basement steps. Nobody knows what the numbers mean, and it is unclear if Hell House staff put them on the wall or if they were already there prior to their arrival. So yeah – this seems like a pretty fun little backstory that will carry us nicely into the film. I must admit, I’m intrigued, and I always feel like the faux-documentary is one of the best utilizations of the found Footage sub genre. We hope to have more to share with you in the coming weeks, so stay tuned. Okay…so, after seeing The Houses October Built, I was pretty much done with haunted house meets found footage movies. But then I thought, how many films actually target this sub genre? Not many. So this movie doesn’t hit the mark.  But the mark is set pretty low. with that in mind, you’ll be entertained and left wanting more, but not necessarily in the good way. It’ll leave you with a few jump scares, but the plot and acting…ehhh not bad! Definitely worth a watch. So is this “found footage” movie based on a real event? How much of the footage was taken of the real event and how much is directed? I can help you out a little here. The entire production is a work of fiction ? Just a movie. Sequel coming soon! Thank-you, my wife thought it might have been based on actual events, because of how an article was written in a news site which will remain nameless. I hope you are right, because horror films dont disturb me… This one did, and for it to be real?.?.?. [Exclusive] Hell House LLC 2 is Basically Finished! That’s right! We’ve got the scoop on the next entry into the Hell House universe. Read all about it right here.